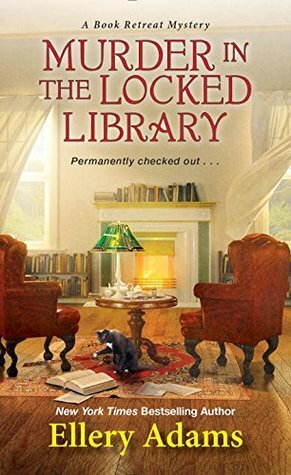 Murder in the Locked Library is by Ellery Adams. It is the fourth book in the Book Retreat Mystery series. The stories take place at Storyton Hall, which is in the small village of Storyton, Virginia. In this book, a rare book society comes to Storyton Hall for a conference. Unfortunately, there is a murder and it's up to Jane and her staff to figure out who the killer is. I enjoyed this book with its small town feel, the secrets that Storyton Hall brings and the wonderful cast of characters. With its libraries named for different authors, to the cloak and dagger of its secret rooms and hidden panels, Storyton Hall is a place I would love to visit. It sounds like the ideal place for a very relaxing vacation. Jane is the smart, independent woman who runs it while also raising her twin sons and trying to solve murders. Aunt Octavia and Uncle Aloysius are helpful with the boys and know all the secrets of Storyton Hall. They add a quirky element to the story. The mystery is wonderful. It kept me guessing throughout the whole book. There were many twists and turns along the way. It caught me up in it from the first page to the last. Ellery has a wonderful way of weaving the story, clues and mystery altogether. I recommend this book to everyone who loves a great story with quirky characters and a mystery that will keep you guessing until the end. I received my copy of this book from the author for review. This is an honest review. Ellery Adams is a Goodreads author. I hope everyone will read this book and all the other of this series. She has other mystery series too. I love them all.